Horseback and Walking Safari - This adventurous safari is the ideal way for an active, energetic traveler to experience the tremendous diversity this part of Africa has to offer. 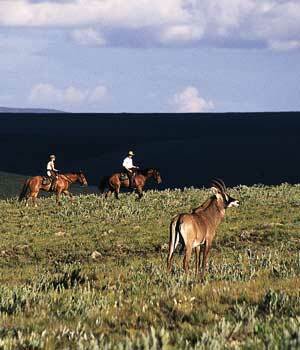 The package begins with horseback riding on the high grasslands of the Nyika Plateau of Malawi. This vast and untouched land is home to herds of eland and roan antelope, and in the summer is covered with a profusion of wildflowers. From there, catch a charter flight into Zambia's famous Luangwa Valley to join a guided walking safari amidst prolific wildlife. The guides are among Africa's best, and their depth of knowledge about the area's natural history makes this an excellent choice for anyone keen on learning, as well as riding and hiking. The Mpherembe Trails safari takes place in the remote northern part of Malawi, a small and politically stable country in southeast Africa. The vast and untouched grasslands of the Nyika plateau are home to eland, roan antelope, zebra, and warthog as well as hyena, leopard, jackal and serval cats. In summer it is covered with a profusion of flowers. The area has been designated a national park and much of it is closed to vehicles, so the back of a good horse is an ideal way to see it. Though it is not far south of the Equator, the altitude makes the air fresh and brisk. The host and guide is a highly regarded naturalist, with a gift for imparting his amazing knowledge of the area's unique flora and fauna in a fascinating way. Each safari is customized to suit the participants' riding ability and interests.